The special effects in the movie perfectly fit the meager budget of the film, and also perfectly fit the tone of the movie. And as impossible as it might seem, this is not the best effects shot of the movie. This is one of the first "big effects" we get to see in the movie, and it caught me completely off guard. I had no idea what to expect from this movie the first time I watched it, but once I saw this I knew the movie wouldn't just be limited to clever dialogue. The two aliens aboard the above spaceship need to find some atmosphereum, the same extremely rare element that our hero, Dr. Paul Armstrong, is also looking for. The Aliens Kro-Bar and Lattis go to the cabin where tha Armstrongs are staying, and try to act human. Paul's wife Betty asks the two (who are using some Earth names: Bammin and Turgaso) to sit down and get comfortable. Kro-Bar/Bammin turns to his wife and instructs her on how to sit down. Dr. Roger Fleming, one of our villains, decides he also needs to talk to Dr. Armstrong, but he doesn't want to so up by himself (it would make them think he was alone). He finds the alien's Transmutatron and decides to use it (He knows how to do this, of course, because he saw the aliens use it to make their Earth disguises) on some of the animals of the forest to create a date for himself. The result is Animala. Dr. Fleming took a few minutes before going to the cabin to try and teach Animala how to behave more human. During dinner, however, her instincts take over. Kro-Bar and Lattis, still trying to act human and thinking this is how people act with food, follow her lead. I wanted to make a gif of the scene where the skeleton climbs down the rocks, but it was huge. I ended up trying to remove some frames and I ended up with that. It was too great for me to pass on. Just know that the actual scene is a lot slower. Kro-Bar and Lattis had a mutant on their ship, which escaped in their "crash". 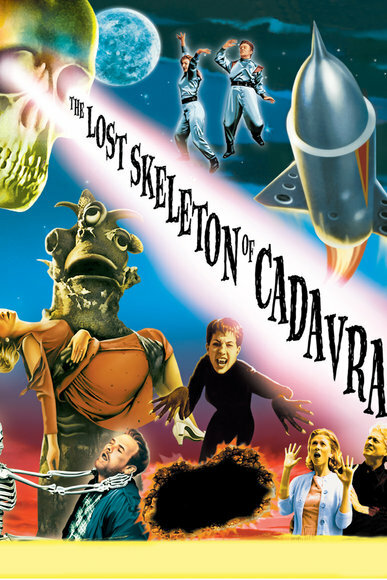 At the end of the film, it comes to the rescue and fights the Lost Skeleton. And it is wonderful.